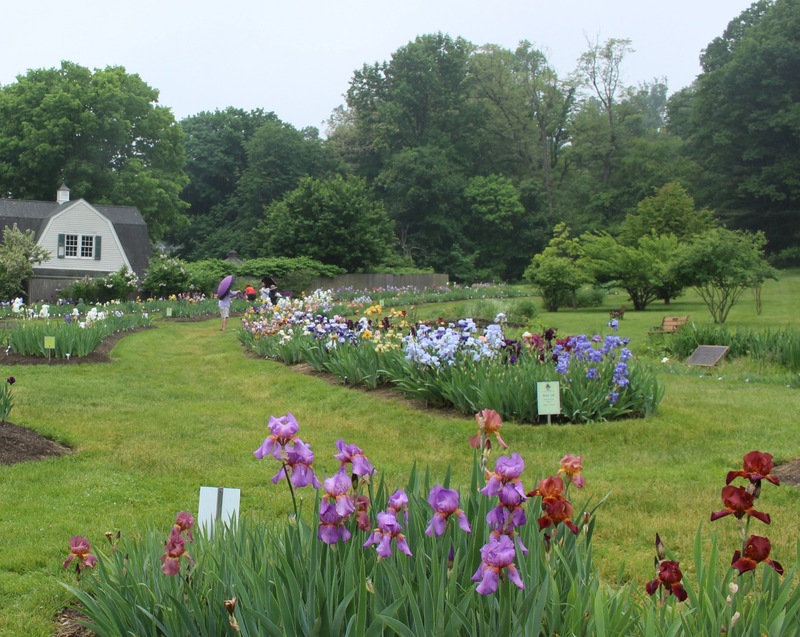 Although it was a struggle to break away from the garden during this (I should be) busy season, a friend convinced me to take a day and ride out to The Presby Memorial Iris Garden in Montclair NJ to finally follow through on a promise to visit. Word was that the hot weather and rain had been tough on this year’s show, but that was all lost on me the minute we pulled up to the entrance and saw the beds full of color. I was way too excited to be there, and just in case there was any doubt left, I’m absolutely a plant nerd. Looking across part of the Presby iris gardens towards the building which houses the Citizens Committee which oversees the gardens. An all volunteer Committee runs and maintains the gardens, and their work is amazing. There were several people out and about tending the beds, either deadheading or staking, and I’m sure that’s quite a job considering how many plants are being grown here and the maintenance needed to keep them at their peak. A bed of more modern iris (~1970’s) stretching upslope behind the house. 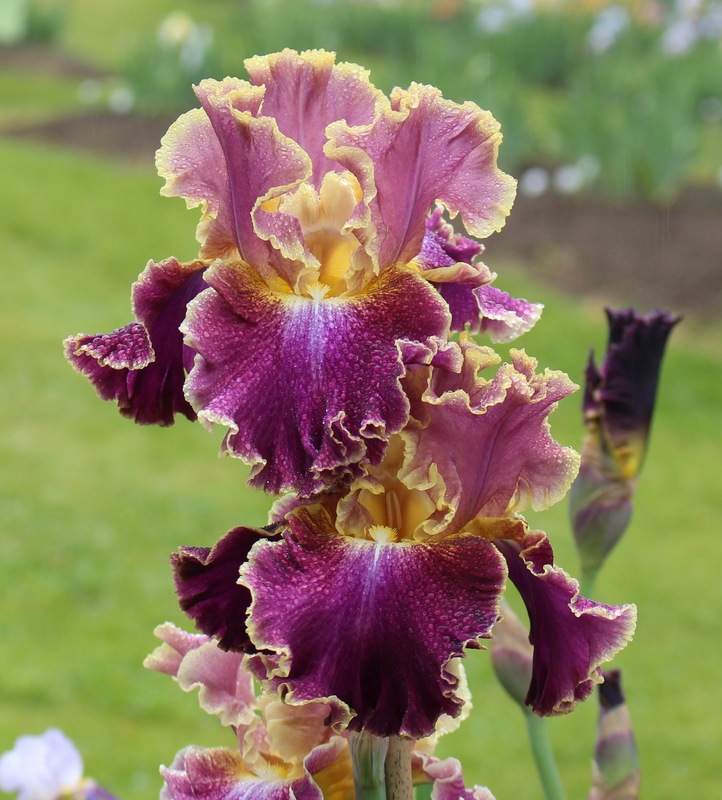 Personally I tend to prefer the older and simpler forms of historic iris (older than 30 years) but I’m only human and the fluffy, ruffly, overblown flowers of the modern tall bearded iris are very tempting. Iris ‘wings at dawn’ (2014). A ‘space age’ iris due to the little tabs ‘launching’ off the falls of the flower. This might have been my first time around so many iris. They put on quite a show and I can see how the garden drew in hundreds of visitors the day before when the weather was nicer (but much hotter). In spite of the fact I had actually brought an umbrella along, a light drizzle started shortly after we arrived and normally I’d complain about my luck, but actually the fine mist only added to the relaxing effect of the pearly light, glowing colors, and nearly empty gardens. A mixed planting near the house. My friend and I slowly took in the plantings. We went back and forth between admiring each bloom to admiring the overall setting and figuring out which varieties we had and which we absolutely needed now that we’ve seen them in person. 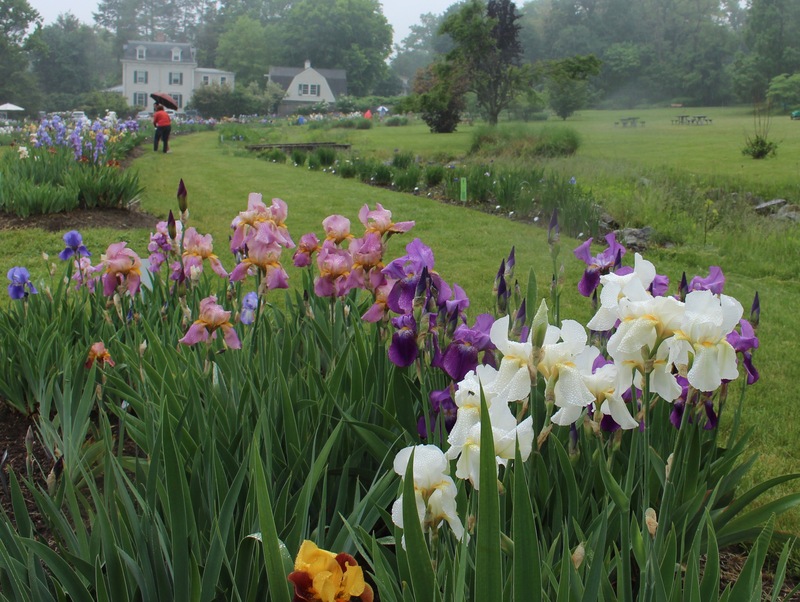 Long iris beds follow the contour of the land along a small creekbed which separates the gardens from the rest of Mountainside Park. Although I was mostly interested in seeing all the older iris this garden is known for, here’s just one more that’s “too much”. Before making the visit I saw an online comment calling the gardens “small”. I guess I can believe that. 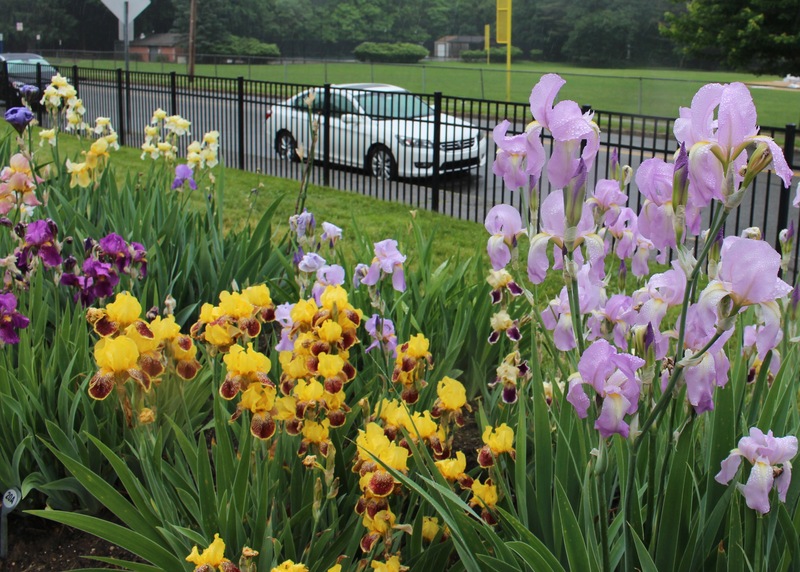 Some people could probably walk the gardens and take a selfie in just over 20 minutes and then hit lunch, but just for reference we iris lovers strolled about in the rain for about two hours before feeling we’d gotten a fair dose of iris. Iris stretching off along the street towards the woods. I did enjoy spending too much time admiring some older iris I’d never seen before. They have a grace and elegance which some of the newest varieties lack and to be honest I might have added a few more to my wanted list. 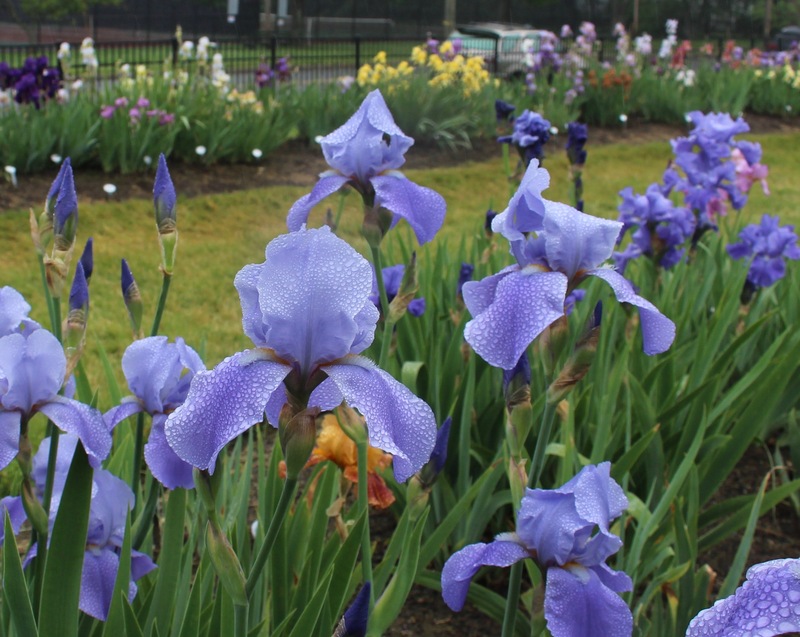 Now would probably be a good time to mention the annual grab bag sale the gardens host as they replant beds each summer, and also next month’s annual Historical Iris Preservation Society (HIPs) rhizome sale. 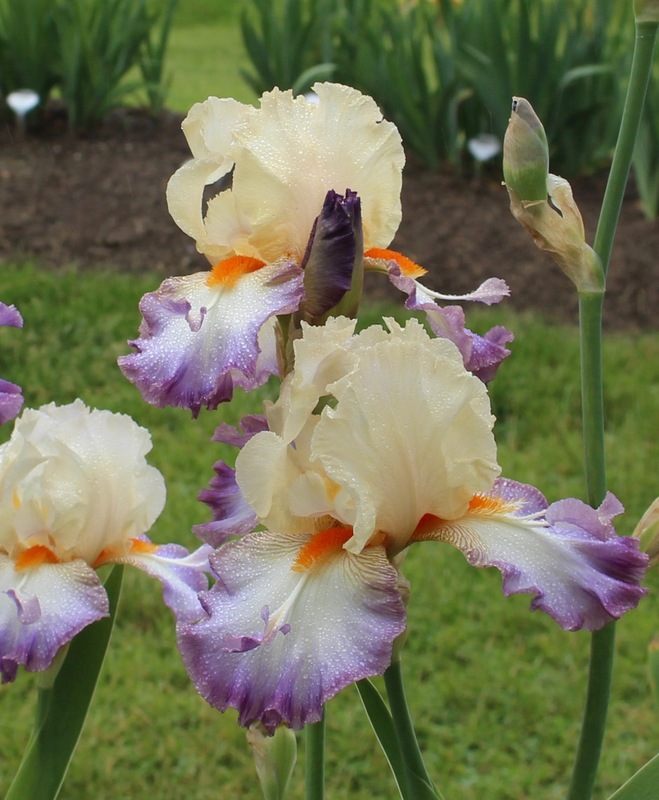 Both are excellent means by which a historic iris addict can add some of the seldom offered older varieties. White iris ‘Titian Lady’ and the rosy ‘Melanie’, both 1941 introductions. 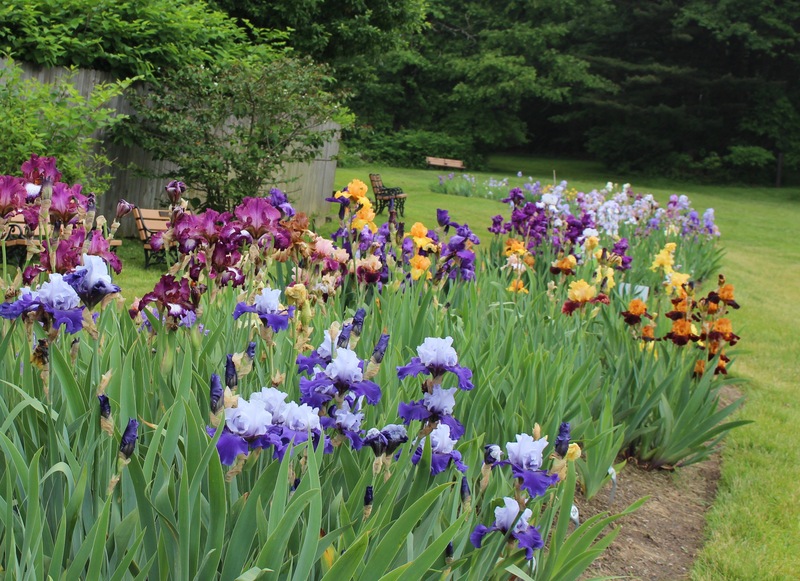 I’ll leave you with just a few favorites as we enjoyed the older iris plantings. I loved the tall historic iris ‘Reingauperle’ (1924). 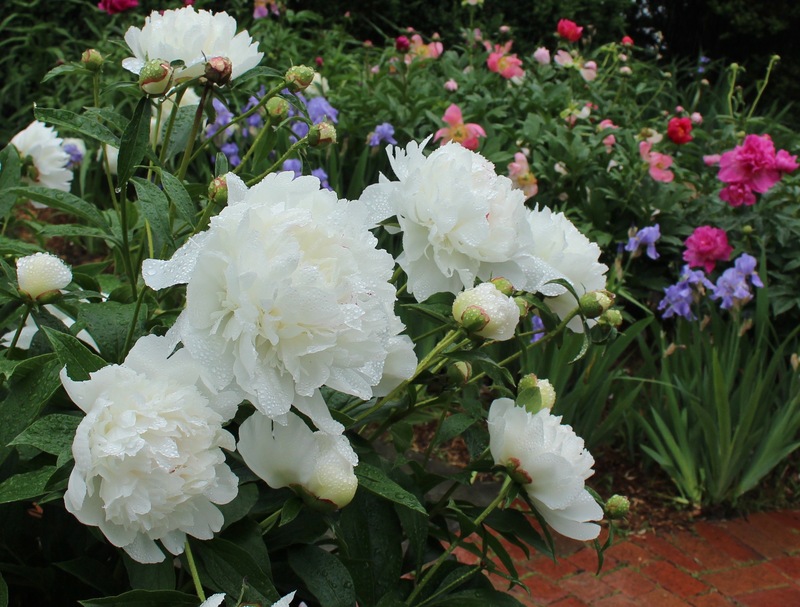 …and there were peonies as well. The entrance to the building next door had a nice smattering of peonies filling its beds. Peonies outside the gift shop. 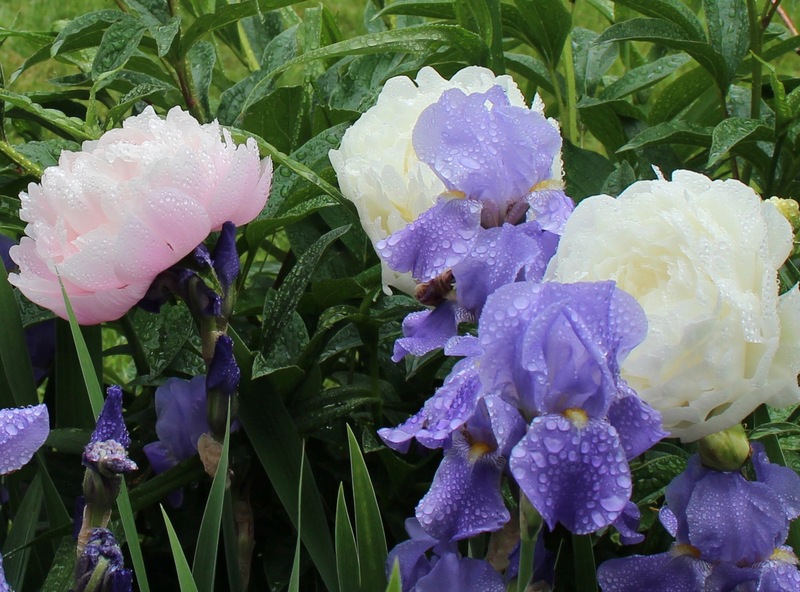 Iris and peonies holding up to the rain. 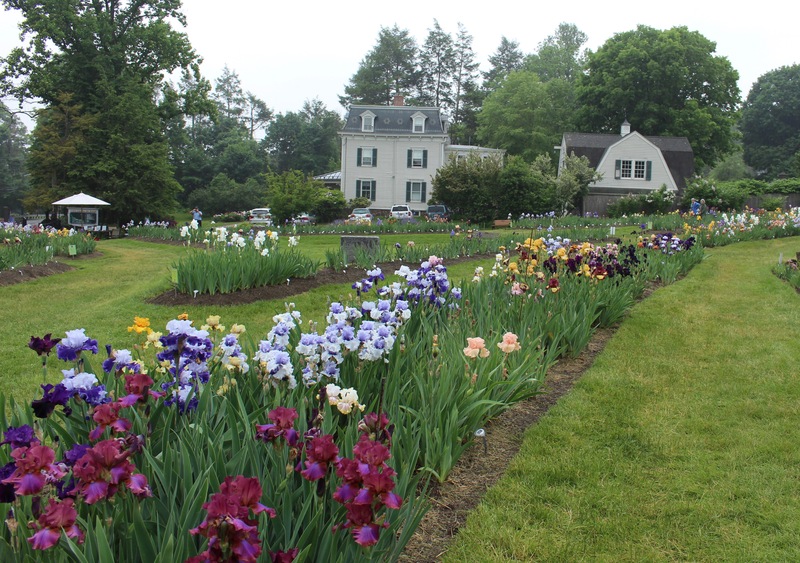 This entry was posted in garden tours, iris, late spring, perennials, Uncategorized and tagged historic iris, iris, Montclair nj, presby iris garden. Thank you so much for sharing this visit. Certainly somewhere I would enjoy visiting. I think I have I. Wings at Dawn or one very similar. I’ve just discovered that there are flowers or plants associated with each anniversary and I was very happy to learn that Bearded Iris is the flower for 25 years of marriage which we’ve just celebrated. I think that’s a great reason to add to my collection don’t you? I do love the newer varieties, but they often look out of place in my lush and often messy garden. Still I can’t help adding one or two every now and then. I remember the iris collection you visited a few years ago. Have you been back since? No, it was rather a disappointment, a competition for new Irises in Florence. What a colorful display. I bet your eyes were dancing through those flower beds. I love the ‘Wings at Dawn’. Actually any of them would be welcome in my garden. Yes, I was all over the place, going from one flower to another and admiring each massive clump! I was expecting them to be a little over the hill, so seeing them so well cared for and fresh was quite a surprise. I would have swooned! I love bearded iris and very few disappoint. A display like this would have me ripping out my older beds and replacing them impulsively. Sort of makes me glad I wasn’t there in person. 😉 Lovely post, Frank! I think it is endless, the temptation for plant lovers never ends. 😉 A happy addiction, however, as far as habits go. What a wonderful display, no wonder you enjoyed it so much! I just wish I could grow them successfully, but we are too wet! It may be too wet for iris in your garden, but your primula, snakes head frittilaries, and meconopsis are an excellent compensation! Gorgeous! 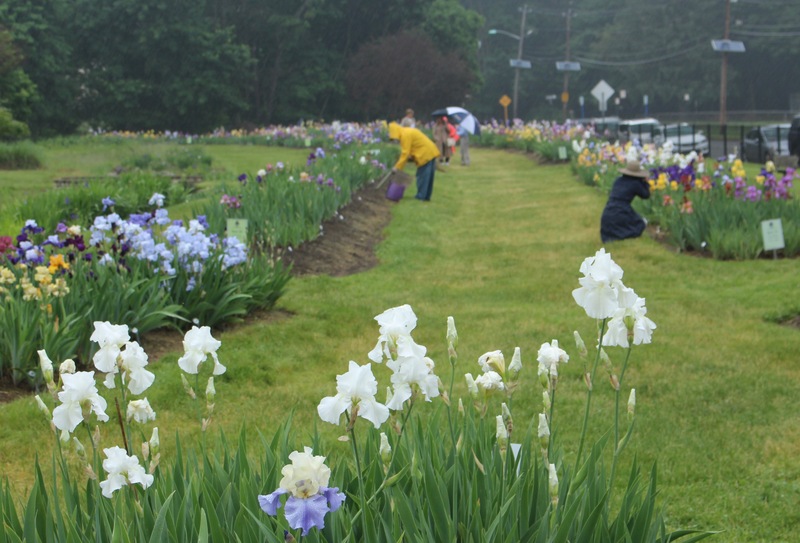 A Mecca for Iris lovers. And they were out in good numbers, both visiting and tending. Oh wow now that is worth the time to visit…stunning. Yes it was, I’m glad it happened this year! That looks like heaven. The sweeps of color and long views are definitely swoon worthy. I grow a few of these older ones but don’t have the best conditions for them or I’d be an Iris addict, too. Just this past week I noticed I am beginning to develop shady spots in the garden. Years of full sun and now this has snuck up on me. I think it’s the curse of any gardener who is easily tempted by interesting little twigs and seedlings, and I can see a day coming when I am also looking at less than ideal iris conditions. Stunning gardens. This would be even more dangerous if they were doing a rhizome presale. See the bloom, mark the box on your order form, pay and forget about it until rhizomes show up at your door in October and you have no idea where you’ll put them all. I’m certain that you’ll find your way back for the sale. 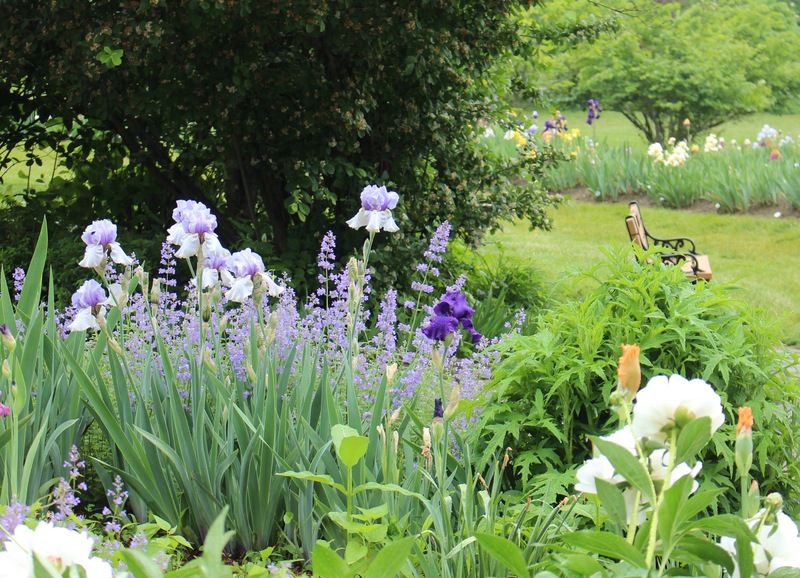 Oh my goodness, I would have been in heaven, I adore irises. And yes, the older varieties are more elegant, I love the Cedric Morris hybrids bred here in Suffolk but some of these overdressed frou frou hybrids in amazing colours are pretty stunning. I wonder which ones you absolutely needed and how you narrowed it down. And I wonder how your plant budget is doing. 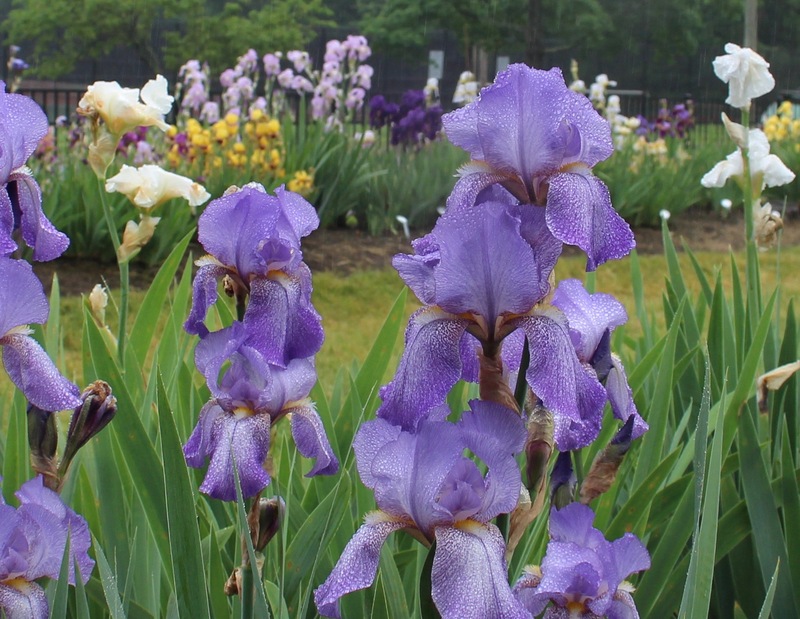 I have a friend who has recently been sending me all kinds of Cedric Morris iris photos. I could easily add a half dozen without a second thought, and worry bout the budget damage later. Actually ‘worry’ might be an awfully strong word to use in regards to my plant budget. I really can’t think of any recent plant purchase which has brought me anything other than glee, and at certain moments I may have even rubbed my hands together gloating over a new purchase. You can never have too many plants, it’s only that tub of saved labels which doesn’t match any living plant in the garden that ever really causes any guilt. Felt I was there with you. This would be a great place to visit. Lovely. I share your appreciation for the older irises. How breathtaking! Just beautiful. My favorite are the irises that have broken coloration or weird speckles. I also love the strange coppery colored ones. Clearly, there was something for every garden in this garden! What a treat to be able to visit a place like that, even though it hard to get away from the work at home. GEEZ! My Iris bloomed and were finished before I could blink this year. Only two colonies bloomed well, though. I think out strange spring had something to do with it. Beautiful photos and great post as always.